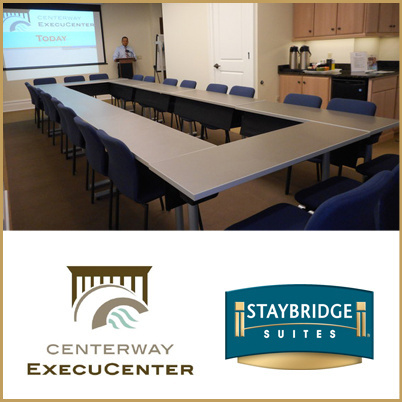 We offer office and desk space rental as well as services tailored to meet your needs, including the Top Quality Meetings™ partnership with the Staybridge Suites of Corning, NY. In partnership, together we offer you complete, ready-to-use office and meeting space, home-like hotel accommodations, efficient technology infrastructure, and professional amenities in Corning NY. We will host your meetings, provide you with extended-stay disaster recovery support, host your off-site project teams, and can do much more. Serviced office and desk space rental is available from the ExecuCenter with amenities and services on your terms, from hourly rental to annual contract. Staybridge Suites offers home-like surroundings that help you feel welcome, connected and completely comfortable in every way while you’re here. Check in, connect, and produce here! For combined meeting and lodging in the new Total Quality Meetings(TM) program, call Staybridge Suites direct at +1.607.936.7800, CLICK HERE, or fill out the form below. To get only office or meeting space, or to initiate a customized solution – call the ExecuCenter at (607) GET-1-123 [607-438-1123] or fill out the Inquiry/Quote form below. We will follow-up with you promptly.